I thought I would share a research paper I wrote for my beginning photography class. 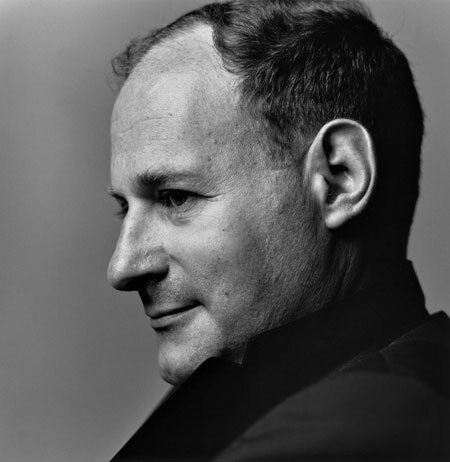 I've always admired Irving Penn's photography; it was a joy to learn more about this gentle, creative artist. Irving Penn was born in Plainfield, New Jersey in 1917 and received a degree in advertising design from the Philadelphia Museum School of Industrial Art in 1938. He began his career as an art director for Junior League magazine and later for Saks Fifth Avenue. In 1942 quit his job to pursue painting. After one year in Mexico, he abandoned the effort, concluding he would never be more than a mediocre painter. Upon his return, he was offered to be the stylist for the cover of October 1, 1943 issue of Vogue magazine. He created a still life, featuring an enormous topaz, and was then asked to also photograph the scene. 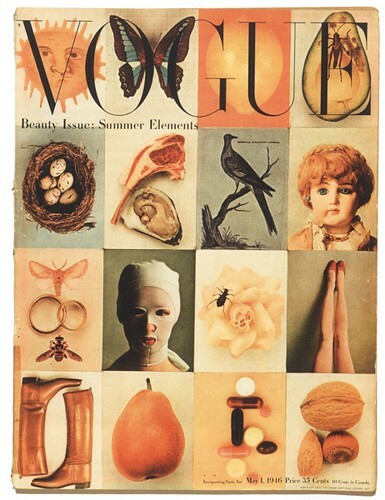 It was Vogue Magazine’s first color cover. 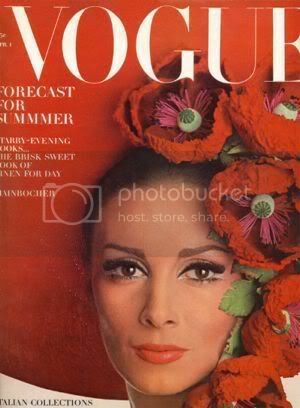 Thus began his long illustrious photographic career and his fifty-year association with Vogue magazine, where he completed 160 cover assignments. 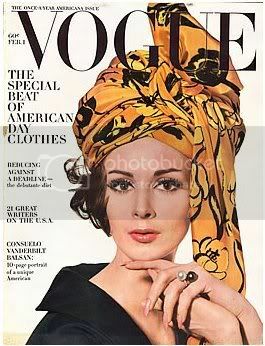 Wilhelmina Cooper, American Vogue February 1st,1963..
Wilhelmina Cooper, American Vogue February 1st,1964. 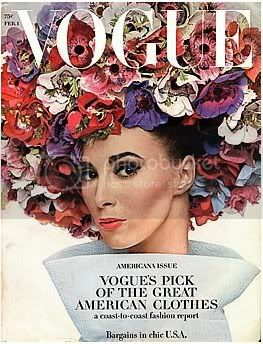 Wilhelmina Cooper, American Vogue April 1st 1965. In 1950, Penn married his favorite model, Lisa Fonssagrives, who was credited with being the first supermodel. Penn revolutionized fashion photography. He was a pioneer in creating a clean, simple fashion photographs emphasizing line and silhouette. He favored the studio setting and stripped away all props creating a minimalist look using only simple planes of neutral color as a backdrop. As a testament to his formal training in advertising design, he never forgot that the fashion products must be the star of his photos. Removing all irrelevant objects served to achieve this goal. The photo used for the April 1, 1950 cover of Vogue, named “The Black and White Idea”, sold for $481,000 at Christie’s Auction House in 1985. 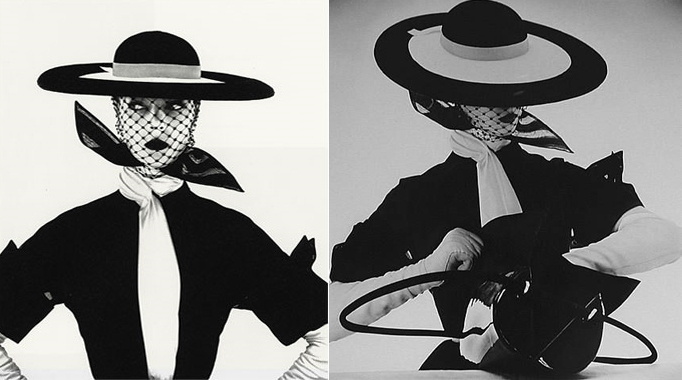 The photo shows model Jean Patchett from the waist up wearing a black and white ensemble. Penn styled the shot with perfect balance, symmetry and obsessive precision. The backdrop is stark white, giving the greatest contrast possible for the mostly-black silhouette. Each fashion detail is highlighted: the wide-brimmed felt hat, the black neck scarf, and the short sleeves with split cuffs contrast to strike a precise silhouette against the white backdrop. The bird-cage netting and Patchett’s deep red lipstick, which reads black in black & white photos, contrast with her light complexion. Her eyes, looking to her extreme right, reveal the maximum whites, lest they get lost behind the netting. The elbow-length gloves were cropped away for the cover, creating an even stronger contrast. Given how the masthead and text of the cover fits comfortably in the white space without ever detracting from the photo, I’m guessing that Penn retained control over final layout. The overall result is a striking magazine cover that is arresting even if viewed from across the street. I have no doubt the cover generated countless inquiries about each piece of this ensemble. Next time, Irving Penn's portraiture and still lifes. What a fantastic post. Irving Penn is definitely one of my favorites, and you have done a beautiful job with this. Thank you for your visit and comment. It is how I found you, and I am so glad I did! A lifetime of pure talent! Thanks for sharing his work and his eye for photography with us! Many of the fashion photos you've shown are of Lisa Fonssagrives, Penn's wife. The Philadelphia Museum School of Industrial Art has gone through a number of name changes over the years, When I graduated it was the Philadelphia College of Art. Today, University of the Arts. Oh, I do love Irving Penn. What wonderful images he created. I doubt I could pick a favorite. As an avid photographer, I have always love Irving Penn's work as well. Thanks for this informative piece. I really enjoyed reading it. Also great to see all of these old Vogue cover, even though I am a guy. These cover photos, such as the one of Grace Kelly, are little capsules in time which are nice to revisit. This is a fascinating read. I did not know who this man was before I saw this post. I am so excited for these Penn posts. I so appreciate his artistic eye, and the studio sense of things, even though I also love more natural and organic portraiture that is evolving these days. That cover that you described so beautifully is just fascinating. Those eyes! Black and white is just incredible in his hands. And those first color covers do have Dutchbaby all over them! All that floral design sense coming through. You clearly have a love affair going on with this artist, DB. I'm very impressed to learn about him through your eyes! Thank you for your visit and kind words. Welcome to Dutchbaby! I agree! My pleasure entirely! I spent many pleasurable hours trying to select my favorites. I'm glad you find this post informative and that you enjoyed the Vogue covers. Thank you for mentioning Penn's Grace Kelly portrait, I was happy to include it in my next post. Fancy seeing you here. Thanks for the compliment and welcome to Dutchbaby! I'm glad you got to "meet" Irving Penn now! Yes, Irving Penn did have an exhibit at the National Portrait Gallery earlier this year. I'm envious you got to see it. Thanks, I'm feeling one hundred percent healthy now - yippee! Welcome to the blogosphere, Sue! I enjoy reading your brand new blog about flowers and beauty around London. You observed well! I think those two Vogue covers of her are perfection! For you to even reference Irving Penn and Dutchbaby in the same sentence is just beyond beyond. I find the evolution of fashion photography fascinating and my do one of my photo assignments on the topic. I love the untouchable, unattainable quality of these portraits as much as the organic ones you mention. Yup, it's turned into a full-blown, sweet love affair! Glad you came along for the ride. I'm embarassed to confess that I knew nothing about this extremely talented photographer. I loved learning about him through your very skilled tutorial. I am pleased to be the one to introduce you to this extraordinary man. Don't mind if I join you for a gin and tonic, even if it is eight in the morning :) Did you know that gin was invented by a Dutch physician? I'm such a big fan! Irving Penn is one of my favorite photographers!! He's one of my favs too. 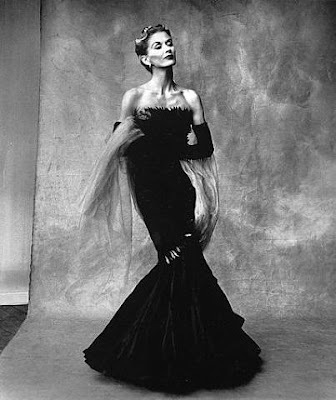 Nobody does it better than Irving Penn!